WARNING! For safety, you should be in good health and free from high blood pressure, heart, back or neck problems, motion sickness, or other conditions that could be aggravated by this adventure. Expectant mothers should not ride. Persons who do not meet the minimum height requirement of 102 cm (40 inches) may not ride. The thrills become even more intense when you rocket into the middle of a Star Wars™ battle in this reimagining of the classic Space Mountain attraction! Dodge blaster fire as you dash through a raging dogfight between Rebel X-wing starfighters and Imperial TIE fighters. It’s an epic scene like something right out of a Star Wars movie! The adventure begins as Admiral Ackbar briefs you on your mission: the Rebel Alliance needs your help flying a reconnaissance vessel to survey an Imperial Star Destroyer spotted near Jakku—a desert planet featured in the new movie, Star Wars: The Force Awakens. An elite X-wing squadron escorts you into hyperspace. You arrive at your destination to find the Star Destroyer waiting for you, surrounded by a swarm of TIE fighters. It’s a trap! As the Rebels valiantly battle the Imperial vessels, you’re caught up in the barrage of red and green blaster fire. The speed and the turns grow more intense as the Rebel squadron begins their final, courageous assault on the menacing Star Destroyer. 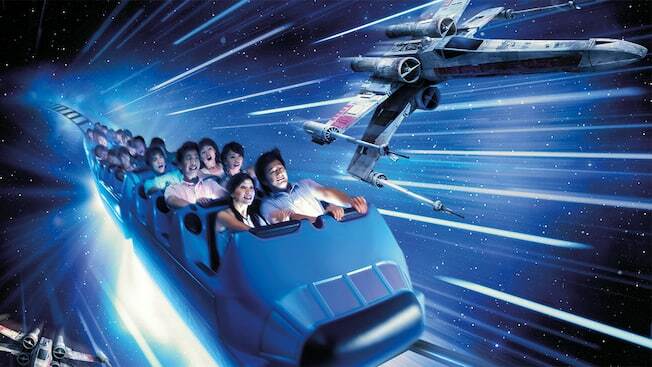 Stay on target… for out-of-this-world thrills on Hyperspace Mountain! Download the official mobile app and see wait times for attractions, locate favourite characters, browse interactive maps and entertainment schedules anytime and anywhere during your visit. Discover showtimes for parades and much more.